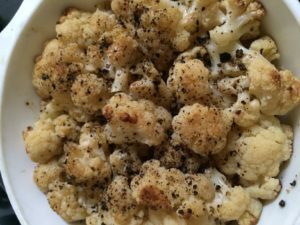 Easy and delicious (though admittedly not beautiful), I made Roasted Cauliflower with Sesame Seed Oil last night and ended up eating almost an entire head of cauliflower by myself. Technically I guess it’s a side dish, and a super-tasty one, but it’s the kind of thing I’m likely to eat as a main, because it’s quick and really filling. This simple recipe works best if you have a roasting dish that just barely fits the dish, and that also has a lid. This will help keep the cauliflower moist, and also helps the sesame oil flavour to infuse the cauliflower, which is totally amazing. Sesame oil is one of my favourite flavours, but I always seem to forget about it unless a recipe specifically calls for it. If you feel like getting inventive, you could add spices – I imagine it would be good sprinkled with harissa, or any mixture of spices that you like. Cut onion into wedges, separating wedges. In a roasting pan with a lid, place separated onion wedges on bottom, cauliflower florets on top. Â Sprinkle with salt and pepper to taste, and pour oil over the cauliflower. Cook with the lid on for 30-40 minutes, checking regularly to make sure it isn’t over-cooking. Â The tips of some of the cauliflower will be brown when it’s done. Remove from oven, add more salt and pepper to taste (if necessary), and serve.